Note: For a while, I’m going to be illustrating the “On the Agenda” posts with various graphs documenting gaps in MMSD. This one is from the Equity Report, which is on the agenda. After an unplanned break from blogging, I’m going to ease back in with a partial run down of this week’s Board of Education agenda. There are two meetings on Monday August 9, an Executive (closed) session at 5:00 PM in Doyle RM 103 and an open session in the Auditorium at 6:00 (plus an exchange of proposals on the Security Assistant contract on Friday). The agendas for the first (and last) are here. Unfortunately the link to the open meeting agenda is broken (fixed now). A Board member scanned a copy for me and I’ve uploaded that (the hyperlinks don’t work, but you can get to the documents by pasting the appendix designation after http://boeweb.madison.k12.wi.us/files/boe/Appx, for example MM 2-8 becomes http://boeweb.madison.k12.wi.us/files/boe/Appx 2-8.pdf). The big item of public interest on the closed session agenda is the Superintendent Evaluation. It is perfectly legal to do this in a closed session, but I don’t think it is good policy. Voters have only the Board to hold accountable and the Board has chosen to funnel most or all administrative accountability into the Superintendency. The public can’t make an informed judgment on the Board when this process takes place behind closed doors. In the two plus years Dan Nerad has headed MMSD, I haven’t seen a single document reflecting the Board’s assessment of his job performance and public discussions on this topic have been rare, indirect and partial. If you are interested in the terms and process of the evaluation, there are some public documents. Superintendent Goals from MMSD Board of Education Progress Report – January, 2010. Process for Evaluation from July 20, 2009. Revised Process for Evaluation, August 17, 2009. Minutes of meetings where this was discussed: November 28, 2009; September 21, 2009; September 14, 2009. The approved Process requires that a summary document be made public. I’ll be waiting for that. Q: How do you receive feedback based on your performance? A: One of the things that is in some ways unique… is that I report to the Board of Education. I have seven bosses, and they do an evaluation process of me… I’m a big believer in self-assessment, so part of my evaluation will be to self-assess. I’m also a believer in what’s called 360-degree feedback, where you get feedback from others involved in the organization, so part of it will involve that… So ultimately it does come down to the Board of Education with multiple kinds of inputs that evaluate my performance. Sounds good, but having 360-degree visibility would be better. I’m running late on this, so the only thing from the open meeting I want to highlight is the “Annual” Equity Report (annual is in quotes because the policy requiring an annual report was passed in June of 2008 and this is the first report — a previous atempt from earlier this year was sent back for revision — I wonder if any of this came up in the Superintendent Evaluation?). You can read more about my hopes and wishes for the Report in this post and this one too. In terms of information provided, this version is an improvement over the first attempt. That said, there is still room for improvement (both with the report and in achieving equity) and there is at least one thing about the first version I like better. What I liked about the first version was that it attempted to identify district initiatives that addressed the recommendations of the Equity Task Force. This isn’t required, but it was nice and useful. The current version uses selected equity-related Strategic Plan measures more than the Equity Task Force work. In this way it serves as a preview of what can be expected with the Strategic Plan reports. I’m withholding most judgment until I have a chance to hear the presentation and the reactions of the Board, but there are some things I do want to note. Might as well start with the graph at the top. Pretty disturbing. The Equity Task Force thought that expanded access to advance programs was of the highest importance and this indicates that the number of high school students taking advanced courses is declining and the diversity of those students is not markedly improving. Two notes before going deeper on this. First, “advanced courses” isn’t defined and second, the graph without data makes it very hard to know what is happening with the demographics. What is worse is the Report simply says “the reason for the decline is unclear” and moves on. That isn’t good enough. The purpose of having this report is to raise red flags so that inequities and bad trends get attention and action. Noting the lack of clarity of causality isn’t going to reverse this trend. 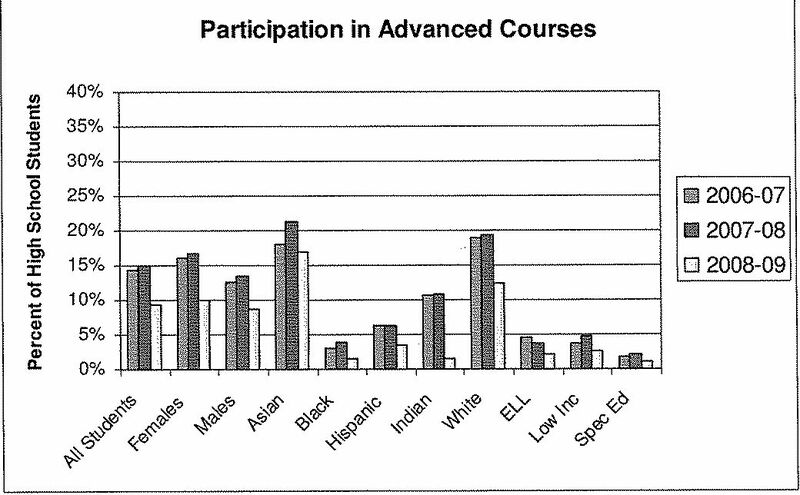 In light of the dismal data on the diversity of TAG participation, I’d also like to see data for all advanced programs, not just high school courses. Achieving equity often requires an unequal distribution of resources and services in response to the unequal distribution of needs and educational barriers. How can you have report on Equity that reflects this assertion and has no budgetary application? More presentations of data by school would be good. The extensive use of climate surveys is a good idea (these are broken down by school), but I’d like to see school level demographic breakdowns here. I want to get this up, so I’m leaving it at this for now.